One of Beervana’s elite craft beer spots, Roscoe’s Pub in Portland, Oregon’s Montavilla Neighborhood is fired up to unleash some tasty offerings for 3rd Annual All-Oregon Craft Beer Summit. Starting at 4 p.m. on Friday July 27, 2012 and running all weekend during the Oregon Brewers Fest, Roscoe’s will feature exclusively Oregon-brewed craft beer on their 16 rotating taps. 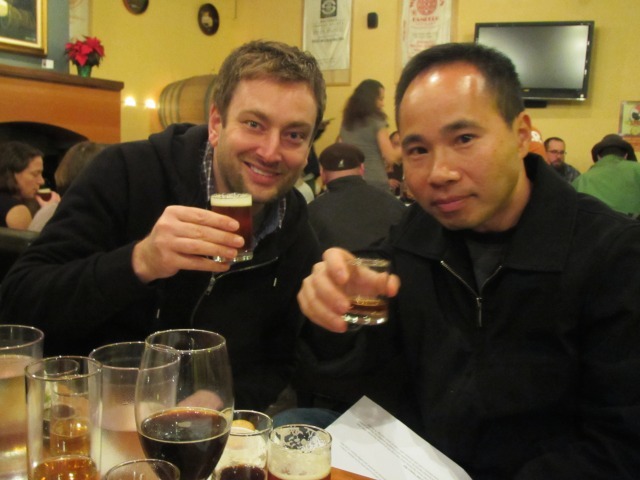 According to publicans/visionaries Jeremy Lewis and Quyen Ly, the selection will include one-offs such as Oakshire Framboise, Upright Barrel-aged Lactovasilios, Deschutes Miss Spelt Sour, Fort George Hellcat Belgian Smoked Pepper Pale, Cadera Mogli Chocolate Porter, Amnesia Dopacetic Double IPA, Pfriem Blonde IPA, Prodigal Son Nitro Fatted Calf Sacrificial Coffee Stout, a Cascade Brewing and Boneyard Beer barrel-aged specialties, brews from The Commons, Gigantic, and many more. Show your love for the greatest beer producing state in the world and raise a glass to Oregon Craft Beer Month! Taster Trays will be available and some of the brewers will be in attendance. See you there, friends! Roscoe’s Pub is located at 8105 SE Stark Street in rainy Portland, Oregon. Cheers!